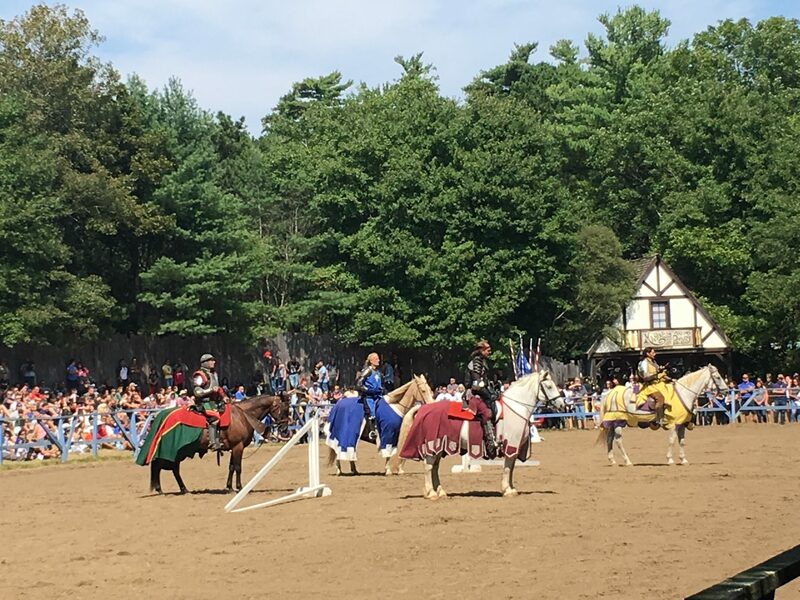 Loads of Family Fun at the 2018 King Richard's Faire! There are eight stages of live entertainment all day, included in your admission price at King Richard’s Faire. 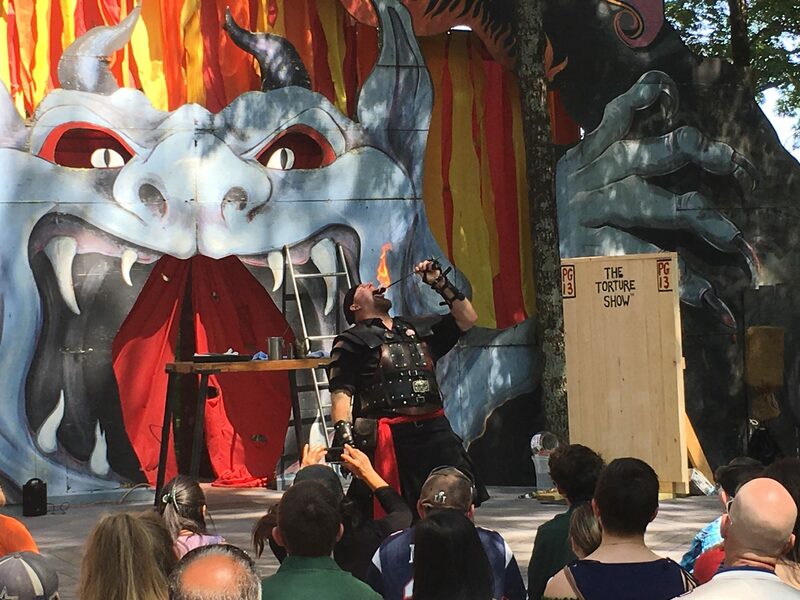 In addition to jousting show, you can see fire eating, magic, comedy shows, acrobatic acts and much more. Many of the performers ask for tips (and some might even beg). If you feel inclined, feel free to tip them. If you don’t want to, that’s ok, too. 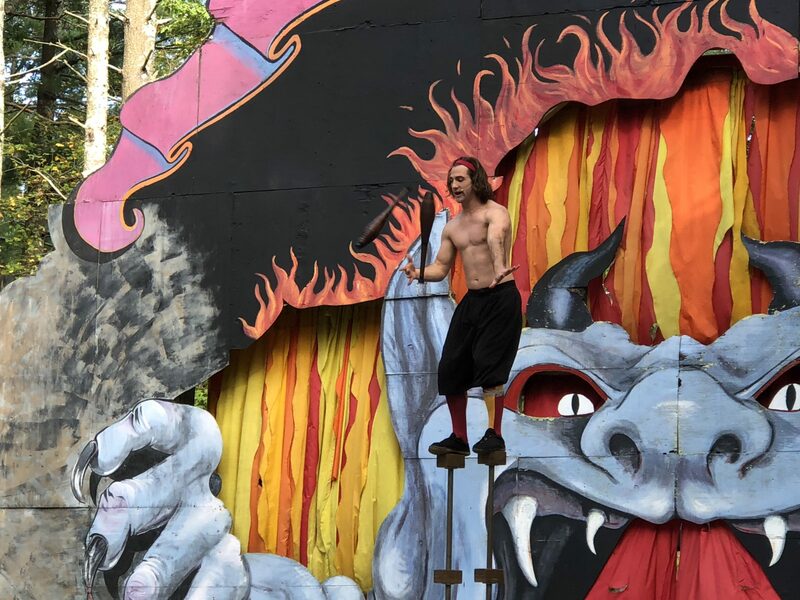 There’s no pressure at all, but in case you didn’t already know this – many of the performers at the faire spend their lives traveling from ren-faire to ren-faire, so they rely on tip money. Just something to keep in mind. Not only will you see trained actors on the various stages, but there are also performers walking around the faire. That’s not even mentioning the guests of the faire who dress up to go. It’s hard to tell who works at the faire and who doesn’t sometimes. One thing that I look forward to year after year is The Torture Show. This guy is incredible. In addition to all his stunts, he’s really funny, so if you go – I highly recommend making it a point to see his show. You will love it. The jousting show is probably the main attraction of the faire. It always draws in a huge crowd and if you get the chance, stop by and see the show. It’s very entertaining. 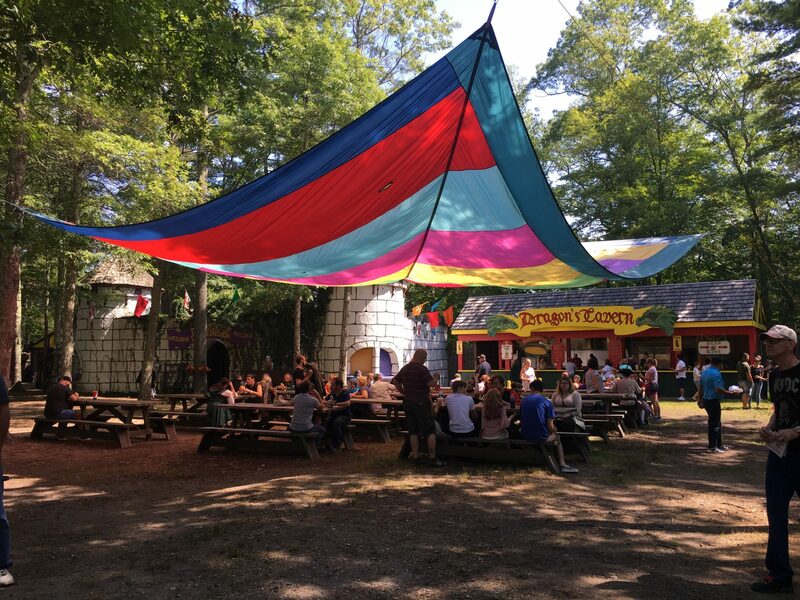 When you enter the faire, be sure to pick up a schedule and plan your day accordingly – there is a lot going on throughout the day and some of the acts only go on once per day, so don’t miss out! If the first thing that popped into your head when I mentioned food at a renaissance festival was one of those ginormous turkey legs, you’re not alone. If forearm-sized turkey legs are your jam, you will be glad you went to King Richard’s Faire. If they’re not your thing, there are lots of other options. Think chicken fingers, cheese fries, ice cream sundaes and cheeseburgers. You can see the full foodie offerings here. In order to purchase food at the faire, you will need to purchase food and beverage tickets. At each food stand, the number of tickets needed for each item is clearly marked so that you will know how many food tickets you need. Food and beverage tickets can be purchased at food ticket booths, unused tickets are non-refundable. Most Renaissance Festivals offer a chance for people to see how everyday items were made back in medieval times. 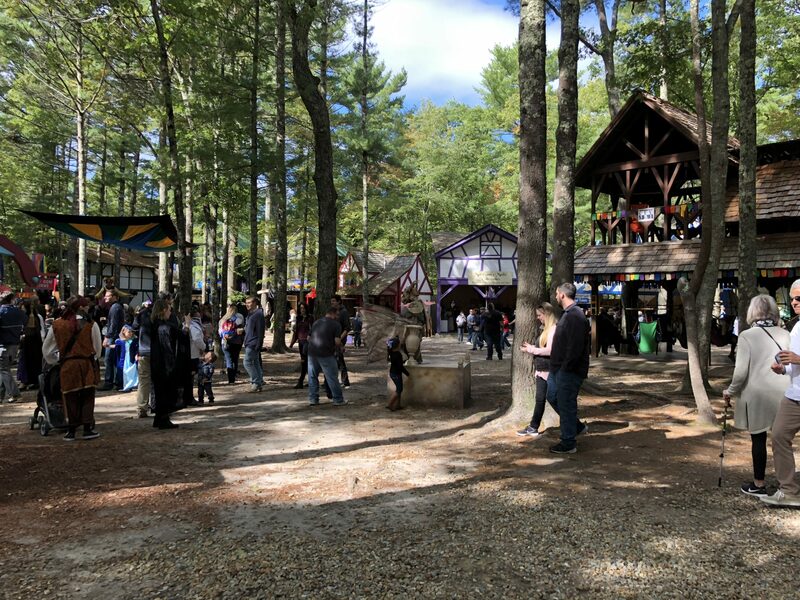 Like most Renfaires, King Richard’s Faire includes a blacksmith, jewelry makers, candle makers, pottery sculptors, glass blowers and other artisans of the time. When you buy their goods, there is a really good chance you are getting a one-of-a-kind item because the majority of it is hand made. 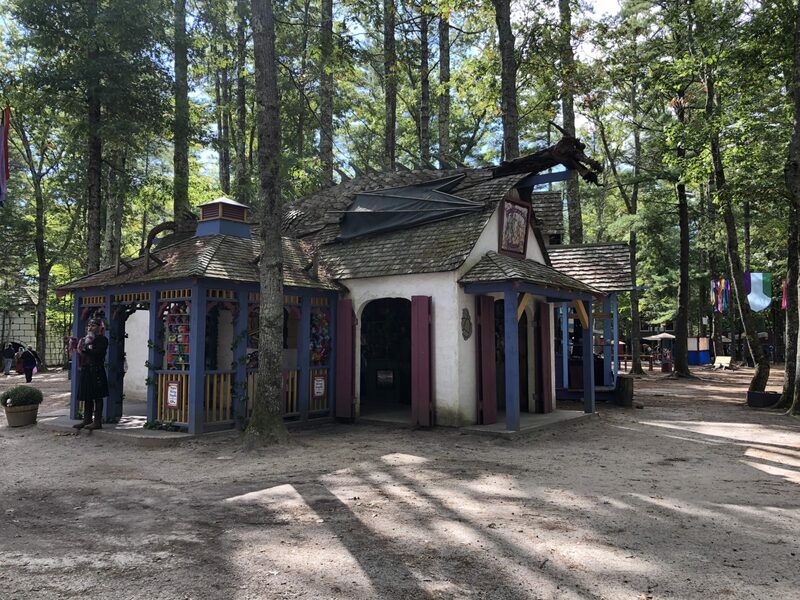 All of the shops at King Richard’s Faire are privately owned, and a lot of their owners are people who have made it their life’s work to make and sell their hand made creations. 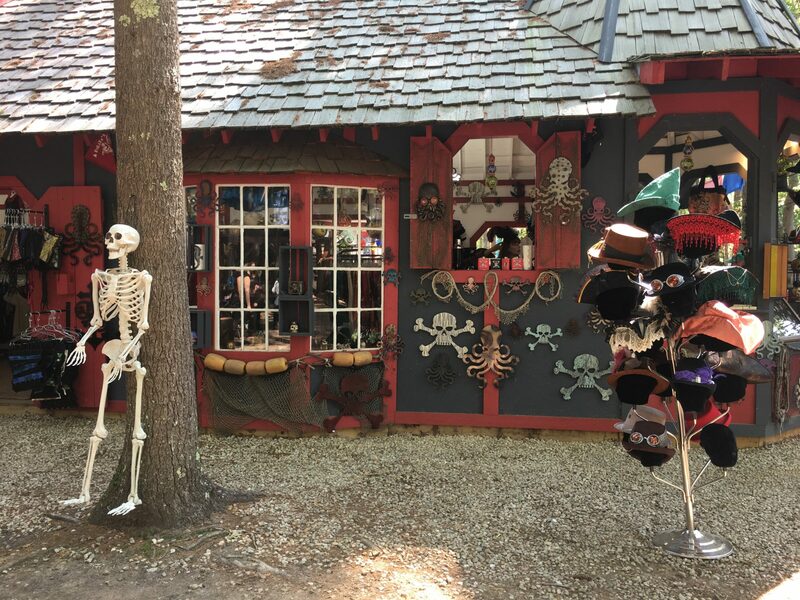 Spend some time browsing their shops because you will find some true gems at King Richard’s Faire. I started my Christmas shopping while I was there this past weekend. There are also a few fun rides at the faire, ax throwing and even some exotic animals. Just note that the rides and ax throwing cost extra. 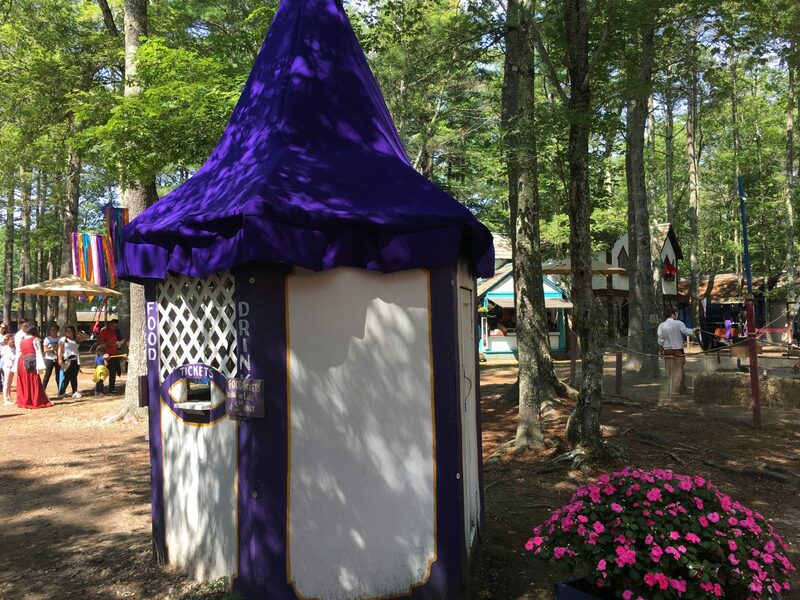 King Richard’s Faire is open Saturdays & Sundays now through October 21 from 10:30 am – 6 pm! Tickets are $32 adults, $16 children (4-11), children under three are free. Tickets may be purchased at the gate (cash only) or online in advance on the King Richard’s Faire website, www.kingrichardsfaire.net (FYI – there is a $2 fee per ticket for online ticket sales). 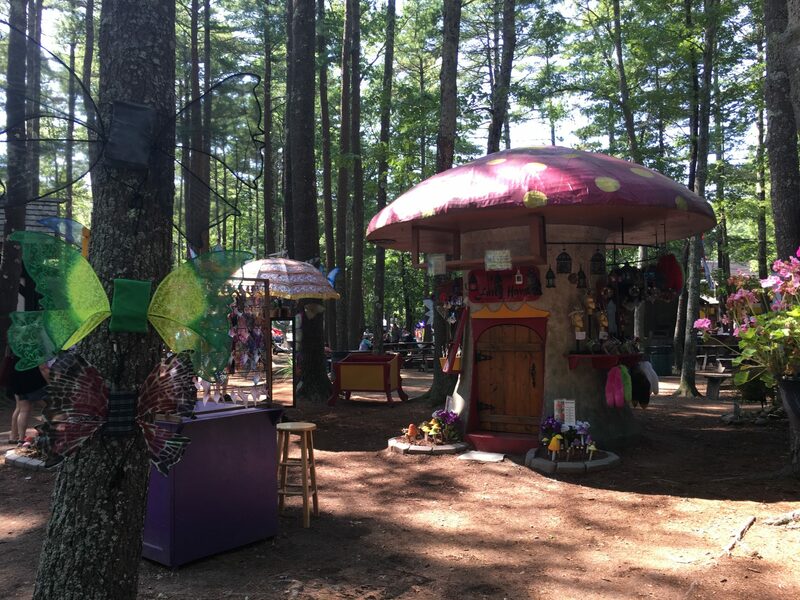 The Faire address is 235 Main Street, Carver, MA. Parking is free and no pets or outside food/drinks permitted. Have you ever been to a renaissance festival? I have always wanted to attend something like this but they never seem to be close to where we live. Bet you had a wonderful time and enjoyed seeing everything. I LOVE these faires! They are my favorite place to go each year! So much to watch and see and so much food to try! I can’t wait until our opens in a few weeks! Oh wow this looks like an amazing faire, the entertainment looks wonderful and hands up you would probably lose me in the shops! This looks like the Scarborough Fair we have here that I would like to go back to this year.. I just need to find a day my son is out of school as the weekends are to busy to be able to look at everything with everyone standing around. Its been a while since I have went to a Faire. Way back in Buffalo, NY almost every month esp. during summer and fall they have lots of fun activities for every ages. This event you have attended with your kids looks like so much fun. That was a great looking fair and the grounds are spectacular. I would love to go to a jousting match and stroll the beautiful area. This place looks so much fun to visit with family. My kids love going to a fair such as this. I LOVE faires like this! We love to get out and see all the costumes, and of course, eat turkey legs! I went to a renaissance festival like this when I was a kid. I would love to take my kids to one these days. I bet they would really enjoy it! I love that there are so many talented performers and artisans to see at this faire. I think we’d have a lot of fun exploring! I haven’t been to a renaissance faire in years. I think the kids would love it. I’m not sure if this one comes to our area, but we do have a huge fair in atlanta each year. I’ve never been to a renaissance festival. This looks like so much fun. I would love to attend one this year. That looks like so much fun! I’ve always wanted to go to one of these festivals. I’m hoping in the next few years I’ll be able to attend one. It has been years since I have attended a fair like this one. Now I want to find one. I wish I was closer to go to this one! Wow that looks amazing and fun. We love going to festivals and fairs like that, my kids love learning stuff about medieval times. The King Richards Faire looks like something that the whole family will enjoy. Thanks for sharing it. I’ll bookmark for when we visit the area. This looks very similar to the Rein faire that we go to sometimes in the summer. It is a great family day together. Now this sounds like it was a lot of fun!! I would love to go to a festival like that!! I bet the food here is so much fun! Love the fact that you have to purchase food and beverage tickets – really gets you into the spirit of the entire thing, doesn’t it?! Wow, this is so cool. I would love to experience the same. I love that there is already a Halloween vibe. I hope to experience to see that event too. How cool is that the fair takes you back to 16th century. Love to visit someday. I have never been to such an event but it does look like fun! How awesome it would be to experience what life was like in the early times! Talk about something exciting to do this season! It’s really nice to be able to attend a fair like this especially since there’s so much to expect from it! Family Fun at Gatorland, Orlando Got Young Celtics Fans? Check Out the Jr. Celtics Program!